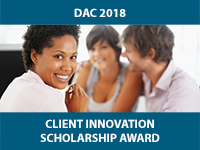 Applications for the 2018 DAC CLIENT INNOVATION SCHOLARSHIP AWARD are now being accepted. The award is open to practicing advisors of all ages; actively engaged in the financial services industry for at least five years. A completed application form, CV and written synopsis of their achievements may be submitted to Distinguished Advisor Conference (DAC) Client Innovation Award before July 31, 2018. Differentiated Value Proposition: how it is articulated, executed and received. New Application of Knowledge and Skills: how continuous improvement has changed the way you manage family wealth with multiple generations. Client Retention and Satisfaction: demonstrable strategies to retain assets and enhance your client’s experience and thereby satisfaction with your offering. Professional Collaboration: partnership with other circles of influence to enhance value to your client. Out of the Box Thinking: new ways to communicate and connect with your clients & prospects. Franklin Templeton is a global leader in asset management serving clients in over 150 countries. We run our business with the same prudence we apply to asset management, staying focused on delivering relevant investment solutions, strong long-term results and reliable, personal service. This approach, focused on putting clients first, has helped us to become one of the most trusted names in asset management. Knowledge Bureau™ Knowledge Bureau™ is Canada’s leading national post-secondary educational institute for continuing professional development in the tax and financial services. It is focused on providing the knowledge, skills and confidence practitioners need to navigate the rapidly changing tax and economic environment their clients face in building sustainable wealth. Its network of graduates in certificate courses, diploma and designation programs spans to thousands across Canada.